BROTHER – CAN YOU SPARE A DIME? That question was born in the 1930’s when a dime would easily get a cup of coffee or a doughnut, or both – when multiplied thousands of Americans were out of work – when hopelessness ran like cold water through the blood stream of this country. Panhandlers, Beggars and Hobos were all out there on the road, traveling, taking risks, surviving anyway they could. These were the same men who built the great American infrastructure and fought a world war. I can remember many a young man, looking older than his years showing up at our back door asking for some odd job to do for something to eat. There was always something to eat in our house. My mother happily provided a heaping plate of whatever was on hand. My next-door maternal grandfather, Shug, kept gardens on several “lots” in our neighborhood and kept us in produce the year ’round. He had a job at Standard Oil – “the plant” – during those years while my father was a self employed barber hauling in 25¢ for every haircut. We felt we were rich. By comparison, we were actually, as it was said, dirt poor. But as children we didn’t know it. There was always something for someone in need. It was, it seemed, not something you thought long about. Generosity, giving, helping – all those qualities that come together in the concept of compassion – became part of the American sprit, or at least I thought so at the time. I think the human being is a naturally compassionate being. Superstition, fear, aggression are all are learned traits. This is something we need to work on. It’s not just a parental issue. It belongs to everyone of us. I am enormously blessed to be witness to, and now and then to be a “player” in the lives of two new Americans – brother and sister – who have been adopted by CA’s daughter and son-in-law. 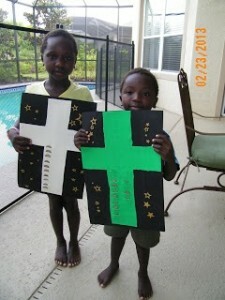 They are Lukas, 4, and Adiline, 6, from Ethiopia. Here they are learning “alms giving” as part of the family’s Lenten season observances. There are slots in the crosses for quarters. It’s not much, but there is a learning experience going on here that is important. It’s good to help others in need. It’s good for them and it’s good for us. It helps to fulfill us and complete us. It’s a part of a Lenten ritual to focus on the disparity between OUR bounty and the NEED all around us and throughout the world. Folks, this is a good thing. This is neither a conservative nor a liberal position. It belongs to no particular religion. It is a human position. It doesn’t matter what the framework is for the learning and the giving. What matters is example and training. It doesn’t matter if there is no immediate or transformative result that can be measured, published or evaluated. It’s the doing that is the end result.